Animation set in the Jingly Jangly Jungle. Raa Raa and his friends go on a journey, driving their vehicles all over the Jingly Jangly Jungle. 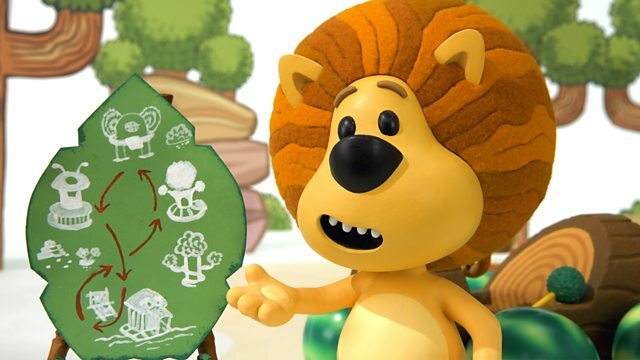 Browse content similar to Raa Raa and the Jungle Journey. Check below for episodes and series from the same categories and more! It's a map of the Jingly Jangly Jungle. here's Rockywockyville, and here's where we are now - my house! Oh, what's that funny noise? I heard a noise. What can it be? Let's go find it. Come with me. -Topsy, you're making the funny noise. It's your trike! Yes! I'm on a Jingly Jangly Journey. This way, that way. Clickety-click. This way, that way, clickety-click. Cubby buggy, cubby buggy, quick, quick, quick! -Hi, Topsy. Hi, Raa Raa. We're on a Jingly Jangly Journey. Ooh. Where are you going? Wherever we like. Do you want to come? Maybe going wherever we like isn't such a good idea. -We need someone who can tell us which way to go. Then we won't bump into each other. -We're on a Jingly Jangly Journey. so we don't bump into each other. So, I'd be the traffic controller? That sounds fun! OK, then. Hi, Zebby. Hi, Ooo Ooo. We're on a Jingly Jangly Journey? -Ooo ooo, can we join in? Of course you can. Come on! This way... Oh, no, no. That way! Whoa! Wait, stop! Watch out! Hello, Crocky. What are you doing? I don't think having two traffic controllers is working. Oh, maybe we can't all go on a Jingly Jangly Journey. Ah! My map of the jungle! Of course! It's a route for our Jingly Jangly Journey. we won't bump into each other. But there's only one map. How are we all going to remember the route? There. Our last arrow's done. It's time for our Jingly Jangly Journey. Using a map of the jungle was a really good idea. And you found a way for everyone to enjoy a Jingly Jangly Journey. come again soon and we can play! Raa Raa and his friends go on a journey, driving their vehicles all over the Jingly Jangly Jungle.